Product #17696 | SKU 801-140 | 0.0 (no ratings yet) Thanks for your rating! The PocketWizard MiniTT1 Radio Slave Transmitter utilizes PocketWizard's new ControlTL firmware platform, is part of an ultra-versatile radio slave system, and is dedicated specifically to the Canon E-TTL II flash control system. It simply slides directly into the camera's hot shoe. There are no special settings to make or modes to call up. Use the camera, on-camera flash, or flash commander controls for flash compensation, zone and ratio control. It supports single or multiple dedicated flash units. The MiniTT1 is the ideal addition to any Canon E-TTL II flash system. It works in combination with the FlexTT5 Transceiver, and since this system works on digital radio technology, it can support E-TTL around corners, out-of-sight, or in bright sunlight. Each setting can also be programmed to transmit any of 20 ControlTL channels for TTL photography and 32 standard channels for manual flash photography. The FlexTT5 Transceiver also has a three-zone selector switch, Out of the box, the MiniTT1 is programmed for PocketWizard channels 1 and 2. 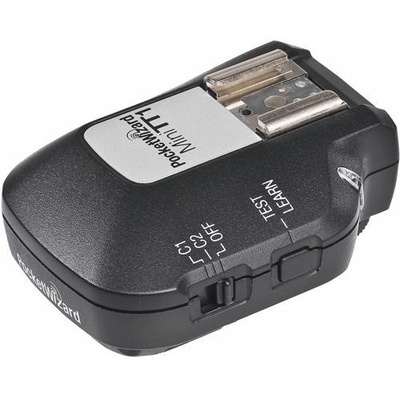 Enables X-sync speeds of up to 1/8000 with full-power flash. High-Speed Sync provides auto flash with the camera's shutter speed setting, up to 1/8000th. Unique programming optimizes HSS for better operation and more shots per set of batteries. Features a hot shoe on the top, so that you can still mount a flash unit directly onto the camera. This allows you to combine your remote flash with the on-camera flash, or use the on-camera flash for additional E-TTL II control only. Hot shoe contacts automatically detect dedicated E-TTL or simple hot shoe flash. Operates on the same channels as all other PocketWizards to work with any unit you may already have. Basic Triggering mode enables standard use with virtually any hot-shoe camera. The MiniTT1 features a mini-USB port, which makes it upgradeable and "future-proof" for continuous improvements and compatibility upgrades. PocketWizard Utility software, available on www.pocketwizard.com enables setting custom functions, adjusting HyperSync timing and setting channels.